A pontifical has instructions for the performance of all the sacraments conducted by a bishop. These episcopal services are often complex with prayers, hymns and processions. This pontifical belonged to the medieval cathedral of St Mungo, in Glasgow. It has early musical notation for hymns. Coronations were performed by medieval bishops. This page gives prayers, readings and instructions for the coronation of English kings and queens. Instructions are written in red. 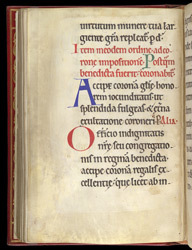 The word 'Alia' in the right margin refers to the prayers for which the 'P' stands. At this point in the ceremony, the crown is placed on the head of the ruler.